This extraordinary man didn't actually become an MP until he was fifty one years of age, and by 1918 he had been knighted, quite an achievement. Sir Alfred's background and interests made him a natural Liberal candidate. He was born in 1863 in London and his father George was a house painter, struggling to make a living. Sir Alfred attended the elementary schools at Bromley and started work in an iron foundrey and then spent thirty years in the musical instrument trade. However he was very involved in local politics from an early age. He served on the old Poplar Vestry, then on the Board of Works, the Borough Council for 25 years becoming Mayor of Poplar in 1903. He was a member of the Poplar Board of Guardians for ten years and chariman for six years. He was chairman of the Poplar Distress Committee for ten years and chairman of Lord Buxton's Distress Committee during the great dock strike in 1889. Under the old London School Board he was chairman for over twenty years of the managers of groups of local schools and for nine years was a Progressive member of the London County Council. 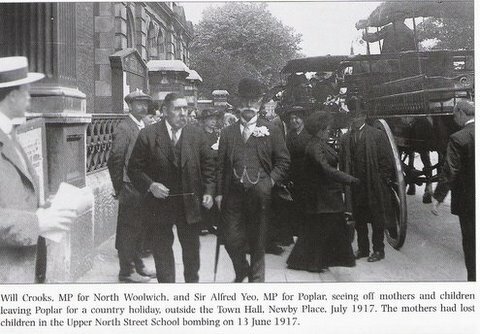 With this background and experience he was naturally a strong Parliamentary candidate and was first returned as a Liberal MP for Poplar in 1914. He served under a wartime coalition government with the Conservatives, headed by the Liberal prime minister Herbert Asquith However by 1916 Lloyd George was chosen by a majority of the governing coalition to replace Asquith as prime minister - the first prime minister to come from a humble background and the only Welshman to hold the office.In the new Liberal government of 1908, Lloyd George had been appointed chancellor of the Exchequer. His economic reforms marked the beginnings of the UK's welfare state, in which government aimed to provide financial support for those most at need. State pensions had already been introduced in countries such as Germany and New Zealand. Lloyd George's Old Age Pensions Act 1908 offered security to the British elderly for the first time. The pensions were greatly welcomed in the UK - the first payments, made on 1 January 1909, were accompanied by public celebrations with bonfires, flags, parades and brass bands. However the new welfare benefits had to be funded. In addition, Germany and Britain were competing to build large fleets of battleships, and this arms race had become very costly. Lloyd George's answer was the so-called 'People's Budget' of 1909, which set out to tax the rich to help the poor. The House of Lords refused to accept the budget, creating a constitutional crisis. Should the unelected Lords be allowed to block the decisions of the elected House of Commons? A new general election was held, which gave the Liberals a mandate for their policy. Their revenge was to limit the powers of the House of Lords in the 1911 Parliament Act. The year 1911 also saw Lloyd George introduce a national insurance scheme to fund welfare benefits. Working people contributed money to the scheme from their wages, as they still do today. 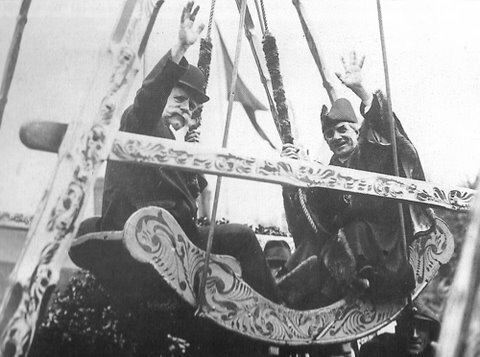 Alfred Yeo, MP for Poplar, with the Revd William Lax, enjoys a ride on a swing at the Old English Fayre in Poplar Recreation Ground, August 1919. Sir Alfred would have been a keen supporter of Lloyd George's reforms to help the working man and in fact in 1918 he was knighted by King George V for his services to the country. This was the time when was a general feeling that the horrors of World War I had to be for something positive. As a consequence, in the same year the war ended, the Representation of the People Act gave the vote to all men over 21 and to all women over the age of 30 years, something I am sure Sir Alfred would have supported, but for the Conservatives this would have been seen as the Liberals gaining more seats in Parliament as the working classes would have voted mainly Liberal. Sir Alfred's main concerns particularly were the questions of rent restrictions during the war years and tribunals for one-man businesses. However in 1921, Lloyd George entered negotiations with Sinn Féin, a party that demanded Irish independence from the United Kingdom, and forced through a settlement that resulted in the Irish Free State. However, the new state excluded the six counties that comprised the northern province of Ulster. This division of Ireland was rejected by many Irish nationalists, and was also opposed by many pro-British politicians. It resulted in many decades of conflict. The Conservatives added to Lloyd George's problems by accusing him of corruption - handing out national honours such as knighthoods and peerages in return for contributions to party funds. Before this argument was resolved, the Tories' anger erupted over another issue - Lloyd George's policy in southern Europe. He was accused of fanning the flames of a conflict between Greece and Turkey. As a result, he was forced from power by his coalition partners in 1922 and the Liberal Party and all its members went into decline, with the Labour party taking over as the main party for the working class people. So when Sir Alfred contested Kettering in 1923 he lost but at the time of his death he was the prospective candidate for Romford. 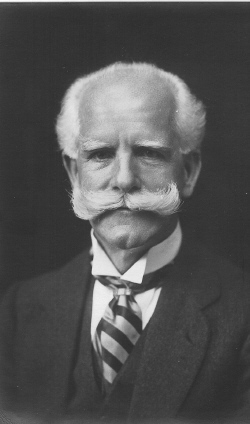 Sir Alfred was a man of strong personality and of picturesque appearance, with his white hair and flowing white moustache. He was an active Nonconformist and interested in the Brotherhood movement, and a promotor of manly sports. He was considered a good judge of brass bands, of which his business had given him special knowledge. MP (l) Poplar since 1914; Member of L.C.C. for last seven years, representing Limehouse;a member of Tower Bench; b. 13 October, 1863; son of George R J Yeo, Devon; married 1st 1886 Mary Ann Brown (d. 1911) daughter of Mrs Stevens; one son; 2nd, 1911, Florence J Stevens, Poplar. Groups; Chairman of Lord Buxton's Committee dealing with distress during great Dock Strike; connected with every local effort in the Boro; caused Government to bring in a Bill to prevent increase of rents during war and six months after; caused Governement to bring in regulations for Tribunals dealing with one-name businesses. Many thanks to Michael (Alfred) Yeo, Alfred's grandson for Alfred's photograph and additional information on the family also to John Smith who sent me the picture of Alfred and the Rev. William Lax.